what equipment are you running with at home? I roast on a behmor plus and my home machine is a modded rancilio epoca! I believe we've met actually, did you have foxy brown in Northcote? I was friends with one of the baristas, I'm from hawke's bay if that jogs the memory. I have a bfc dual boiler, currently paired with a robur. I've been through single boilers & commercial machines but I think the bfc will stay for a long while. Also have a moccamaster, hario syphon, chemex etc you could say I'm a bit of a nut! Roasting on a correto,using a Bosch gun and breville big loaf, I'm pushing 1kg roasts, but can also go as low as 600g. (maybe lower, never tried). Have considered building a kkto but, irrational as it sounds, I don't want to learn a new roasting process. Hi guys, just a quick welcome to Abid Kashmiri, who's joining us as a member (just getting his registration through) and a sponsor - see his boutique green bean thread under Sponsors called 'CoffeeCurators'. Great stuff! Welcome fellow Brisbanite! Thanks for the welcome! And thanks KK and A. from admin for setting it all up, much appreciated. Apologies for the delay but I am now up and running and look forward to this new venture. I'm in my early 30's and have been in the coffee/cafe industry for a little over 8 years. The necessity for work whilst at uni was what started me on this little coffee journey. I think it is a great industry and community and look forward to getting to know you all. I just run it out of home for the time being over in Moggill. What side of town are you in? Thanks for the welcome and the well wishes. Happy to share any curiosities regarding my coffee journey thus far. Look forward to hearing a bit about yourself as well. Okay, I am a naive late starter, in south east Qld that is going into the coffee business, because it is a passion and a longing. What I am hoping to find on this forum is a "Mentor" for my mobile business. I am aware of the pitfalls (well a lot of them) and the amount of hard work I am going to have to put in and although this is daunting, it is not too scary . The scary part is the actual start up and all the hoops I have to jump through(some of those hoops are flaming). I am determined for this venture to work because I want it to.... so very much. Anyhoo, if there is some kind soul that will take pity on a poor, knowledge hungry, passionate, mature age entrepreneur, my (currently exploding) mind will be so very grateful. Hi DizzBean, welcome to the forum; it's been a little quiet over the Xmas/New Year period but there are plenty of people who can help answer various coffee questions, although am less certain about the number of members who have a mobile coffee business... anyway feel free to ask questions; am sure we'll be able to help with most things coffee-related! Im on the coast up Eumundi way, and Im actively mentoring / coaching a few coffee startups at the moment - and Id be happy to help! I moved up from Melbourne a year ago after having run my own highly acclaimed cafes there for 12yrs (top 20 melbourne coffee destinations according to beanhunter and i was in the top 100 coffee destinations in The Age Good Cafe Guide for five years in a row! good luck with your venture and feel free to PM if I can be of any further assistance! Thank you so much for the replies, I am happy to devour any advice that is thrown my way (buckets full are welcome). I am situated half way between Brisbane and the Gold Coast so pretty close to you Koffee Kosmo. I am not familiar with forums as I rarely have much to say (except my worldly wisdom) so, lets just assume that I am completely clueless and tell me just how one would go about PM'ing someone here please. Hi dizz we're all constantly learning no matter where we are at in our coffee journey ! 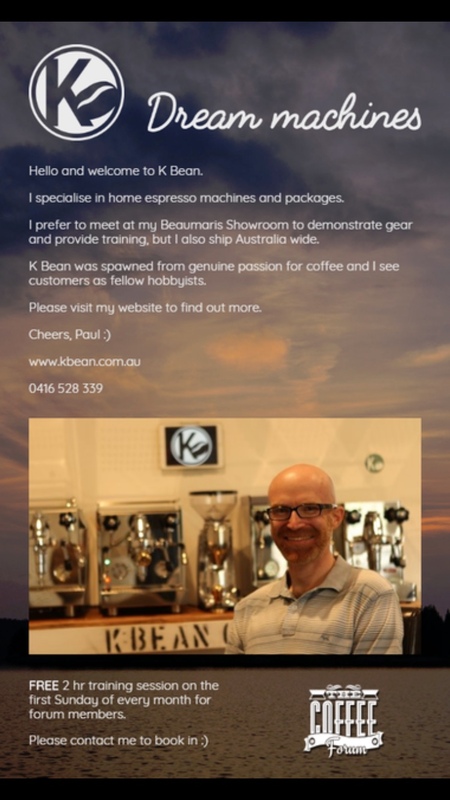 It's Paul here from K Bean Coffee. I'm not new here, but I am new as a site sponsor. It's great to be onboard and I really look forward to getting more involved. Hi Paul and welcome aboard as a sponsor!! We're really looking forward to your enthusiasm and sharing your passion! Hi Paul, just repeating my earlier welcome - great to have you on board! Thanks Brett - I'll share my passion alright! Thanks again for the warm welcome Ash. Hi. I'm in Northern Tasmania near Launceston. Started four years ago with a Jura Ena One Touch (convenient, but weak). Have also had a Sunbeam 6910 which I eventually got to produce decent coffees by chucking the grinder that comes with it for a Breville SmartGrinder. Now a Breville Oracle. I roast in a Behmor 1600, getting very good results. Getting upgraditis and looking at good lever machines - up to the new fancy profiling machines. I really only make one or two coffees in a session (at most twice a day). Welcome mate! Can you tell me... is coffee actually grown in Tasmania? You see there is a local business here in Brisbane advertising Tasmanian coffee. There no roast date but also no information about the provenance. I'm not interested In stale coffee but the assertion intrigues me. Welcome!